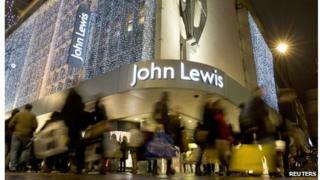 John Lewis has reported strong trading over Christmas, with like-for-like sales up 6.9% from a year earlier. Sales at its stores rose 1.2% in the five weeks to 28 December with online sales soaring almost 23%. House of Fraser also reported solid Christmas sales, but Debenhams announced the resignation of its chief financial officer, Simon Herrick. His departure has come just two days after Debenhams warned of a disappointing Christmas season. As a result, Debenhams will have to discount further and the department store chain warned that profits for the six months to April 2014 would be £85m, down from £115m in the same period a year earlier. Debenhams shares fell another 1.4% after slumping 12% on Tuesday. Media captionAndy Street, John Lewis managing director: Shops needed "to support online growth"
John Lewis reported that for the five weeks to 28 December sales totalled £734m. The company said the growing popularity of its click-and-collect service, which allows customers to buy online and then pick up in a store, played an important part in its strong Christmas performance. Sales from click-and-collect jumped 60% compared with 2012. "Our shops and our online channel, bricks and clicks, came together and it's a story of the two being hand in glove and that giving the customer what they really wanted and then we got the pricing right on top of that," John Lewis managing director Andy Street told the BBC. The retailer saw a surge in activity in the 10 days before Christmas, with city centre stores experiencing record sales on Monday 23 December. Among the most popular items were tablet computers, Christmas lights and coffee machines. Unlike many other retailers, John Lewis did not discount before Christmas. But its first day of sales on 27 December saw record trading, with the retailer taking £35.6m. John Lewis was not the only retailer to enjoy strong sales over Christmas. House of Fraser said it had enjoyed its best Christmas trading period on record, helped by a jump in online sales. Like-for-like sales for the three weeks to 28 December rose 7.3%, with online sales up by almost 58%. Retail analyst Neil Saunders from Conlumino said: "John Lewis and House of Fraser's good numbers tell us that those retailers who created aspirational offers which excited and interested customers did well. "That they are not necessarily the cheapest retailers on the High Street signals that people were looking for value, rather than just price." There was concern about the strength of sales in the run-up to Christmas when many retailers started discounting. Marks and Spencer was among those stores offering big price cuts and there is much interest in its trading statement scheduled for next week. Analysts are expecting it to report weak clothing sales. "Anecdotal and observational evidence would suggest that the much-vaunted autumn/winter range has failed to galvanise M&S's performance in womenswear, as evidenced by the pre-Christmas discounting," said Bryan Roberts, from Kantar Retail. "Despite what is expected to be another strong showing from the food part of the business, poor clothing sales and heavier than anticipated markdowns might see M&S's earnings suffer overall," he said. But there is more optimism surrounding Next, which is due to issue a trading statement on Friday. "Next numbers are bound to be solid. The fact that it did not engage in discounting activity before Christmas will mean margins have held up well," said Conlumino's Mr Saunders. "It remained a popular destination over the festive period, although most of the growth will probably have come from the Directory business rather than from stores," he added. Video Why has Debenhams stumbled on the high street?